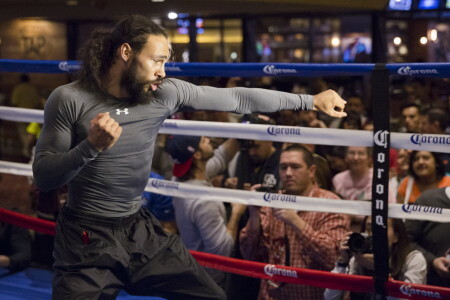 (Photo credit: Esther Lin/Showtime) Interim WBA welterweight champion Keith Thurman says he sees #1 WBC, #2 WBA Amir Khan (29-3, 19 KOs) as an overrated fighter. Thurman feels that Khan hasn’t beaten anyone at welterweight yet, and that he’s now fighting Devon Alexander for a possible chance to get a fight against boxing’s biggest star Floyd Mayweather Jr.
Thurman feels that Khan should at least be fighting actual welterweights without catch-weights. Thurman has made no secret to the fact that he’d be more than willing to share the ring with Khan if he would be willing to take the fight. Thus far, Khan hasn’t been mentioning Thurman’s name as someone he’d like to fight. Khan’s wants the big fights against Mayweather and Manny Pacquiao, and if all he has to do to get those fights is beat Alexander, a fighter known for not being a big puncher, it’s definitely going to be easy on him. In Khan’s last three fights, he’s beaten Carlos Molina, Julio Diaz and Collazo. Those aren’t exactly the murderer’s row of the welterweight division. Molina is a light welterweight, as is Diaz. Saturday’s fight will be Khan’s first against a welterweight in his prime. Collazo is a fighter that hasn’t been relevant for many years, and it’s kind of surprising that Khan was matched against him instead of someone that is still in the thick of things in the welterweight division. Khan obviously is unproven at welterweight, but if he can get past Alexander then he can say he’s actually proved himself. Whether that win will be big enough for Khan to get a big money fight against Mayweather is the big question. That will be up to Mayweather to determine if he wants to face Khan at that point rather than waiting for Khan to prove himself against a tougher welterweight like Thurman. If Mayweather is going to insist that Khan fight Thurman before he’ll agree to fight him then I think he’ll be waiting a long, long time, because Khan’s manager Al Haymon and his promoters at Golden Boy Promotions likely won’t let Khan get anywhere near a puncher like Thurman. Khan barely made it past Marcos Maidana in 2010 before getting knocked out by Danny Garcia in 2012.